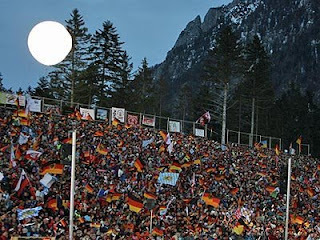 What an amazing party atmosphere in Ruhpolding, near the German/Austrian border. This is one of the big World Cup events spread over five days, with different races each day. Biathlon is a fantastic trading sport - you have brilliant marksmen/women who aren't very quick skiers, then you have the very fast cross-country skiers who might crack under pressure when shooting with a crosswind and a rapid heart rate. The German women won the relay today, but the men's relay tomorrow is wide open with several teams in with a winning chance. Norway are the big names, but Austria have won the last two relay events. You can never rule out the Russians and of course, the Germans are on home soil. Tune into Eurosport tomorrow at 1640 GMT for live coverage. To learn the basics of how to trade on biathlon, click here for the Betfair Education guide to this great sport.